January and February are the dead of summer here. The city is hot and muggy with torrential downpours about half the week. So it’s no surprise that by February, everyone escapes the city. Like August in Europe, February is the month of vacations. 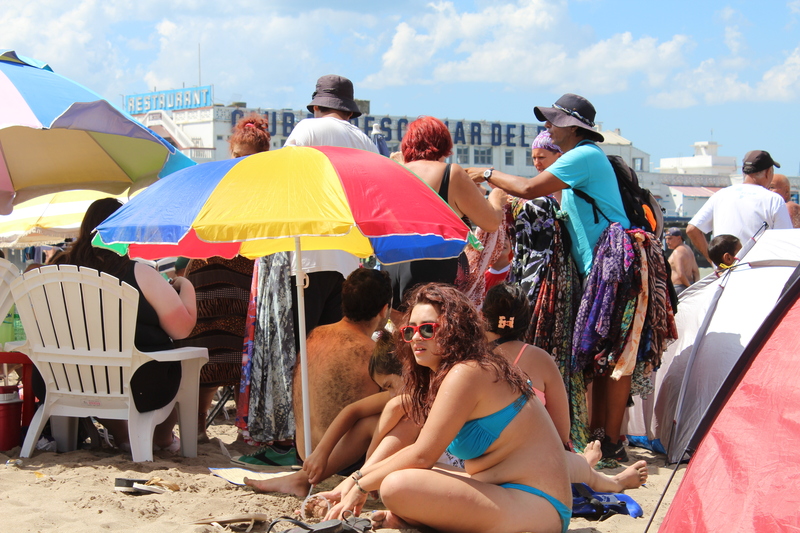 Shops around the city close for “vacaciones” and everyone makes a bee-line for the playa. 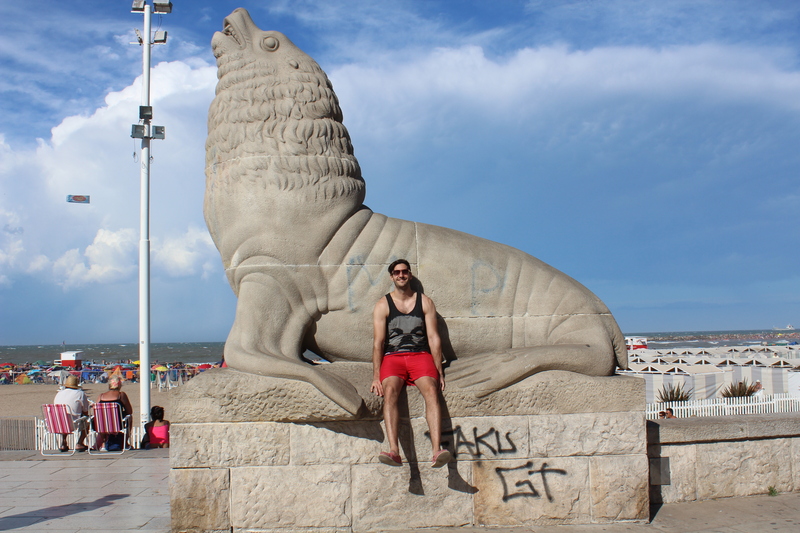 This presidents day weekend, we decided to check out the city of Mar del Plata for our own beach vacation. 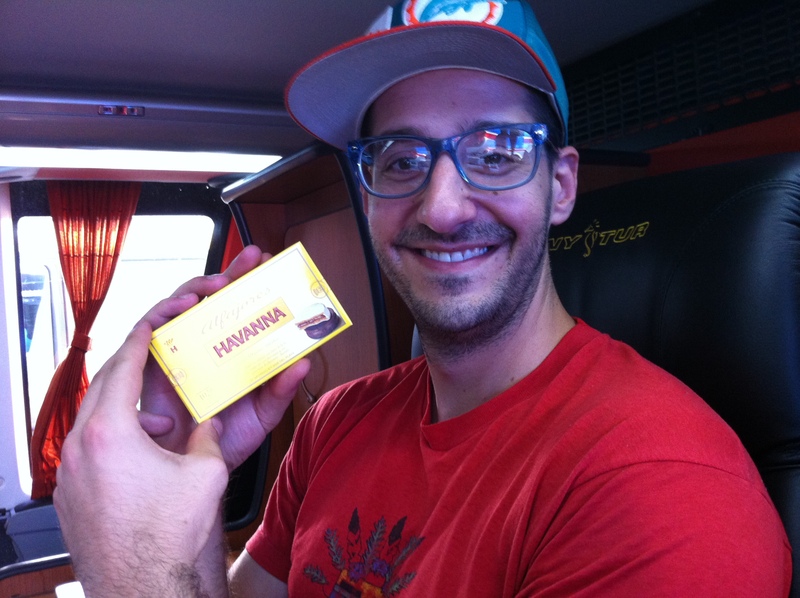 We got on the bus and were handed a mini box of Havana alfajores!! so yummy and exciting! 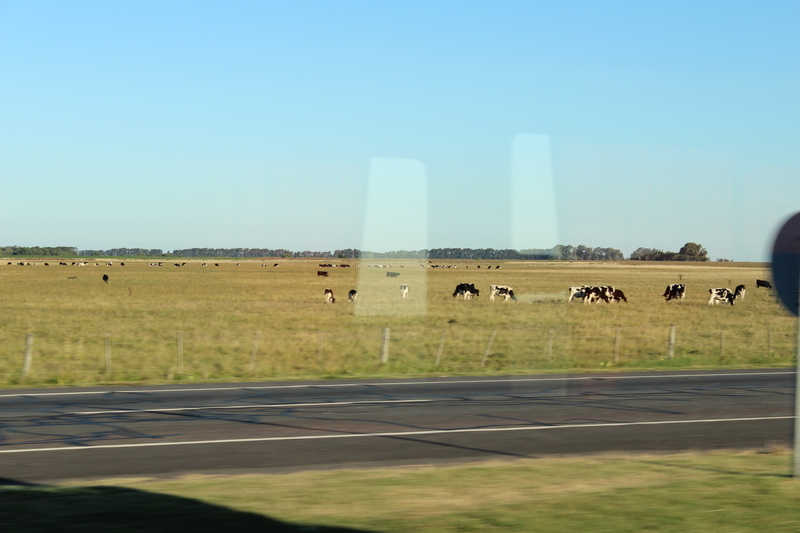 Our view during the 5 hour bus ride down to Mardel, as Argentines call it. Caballos y vacas galore! The apartment we rented was amazing. 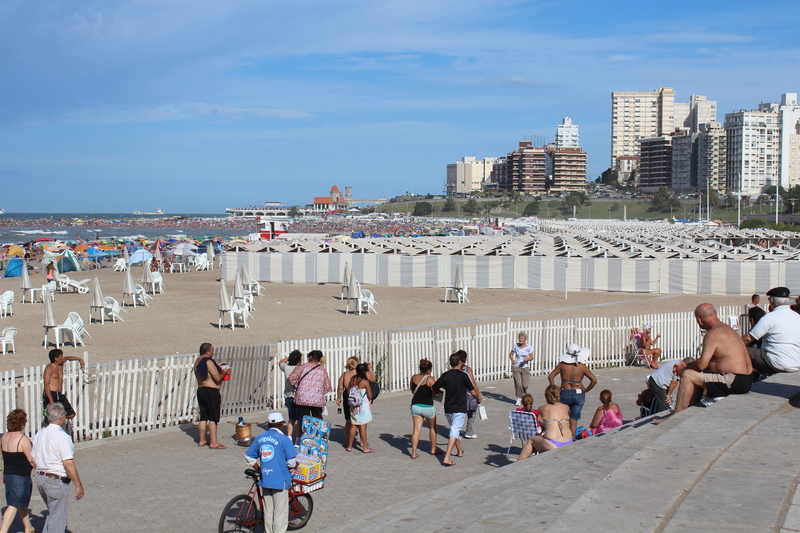 It was about a 20 minute walk to the beach, but was nice and open with lots of windows and a little terrace outside. Each morning we had ourselves a little breakfast in the loungers and each night ended the evening with a glass of wine looking at the stars. Our first day we slept in a bit and then took a cab the 5 minute ride down to the beach. 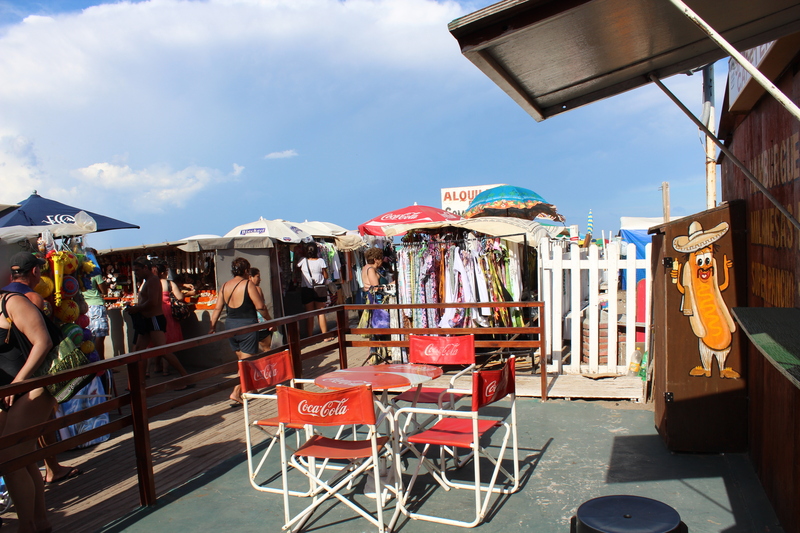 A lot of the beaches in Mardel are privately owned with cabanas you can rent and restaurants attached. 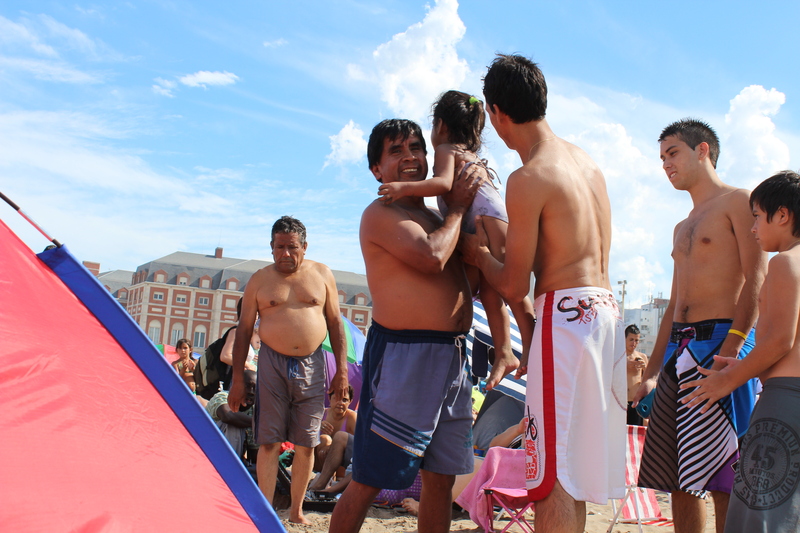 We went to a beach that was open to the public and more local. You just find a spot (if you can) and plop yourself down. 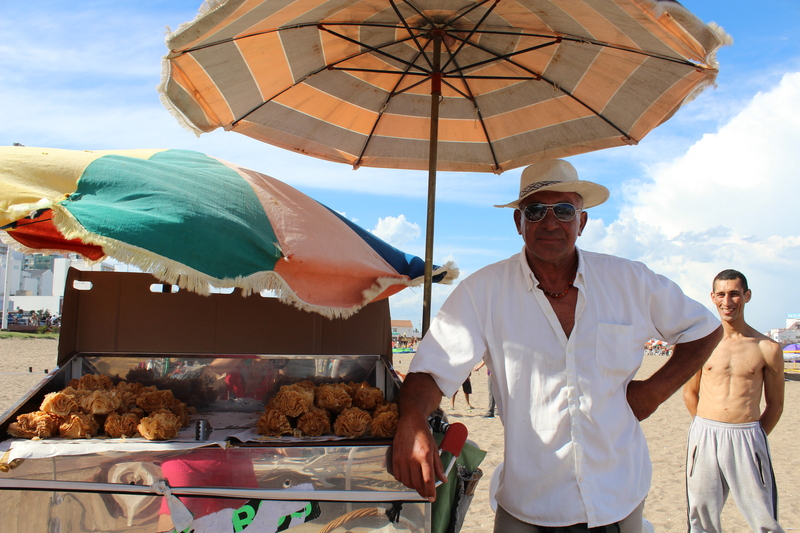 Vendors walk around selling everything from clothes and sunglasses to beer, sandwiches, dulces, and even popcorn. 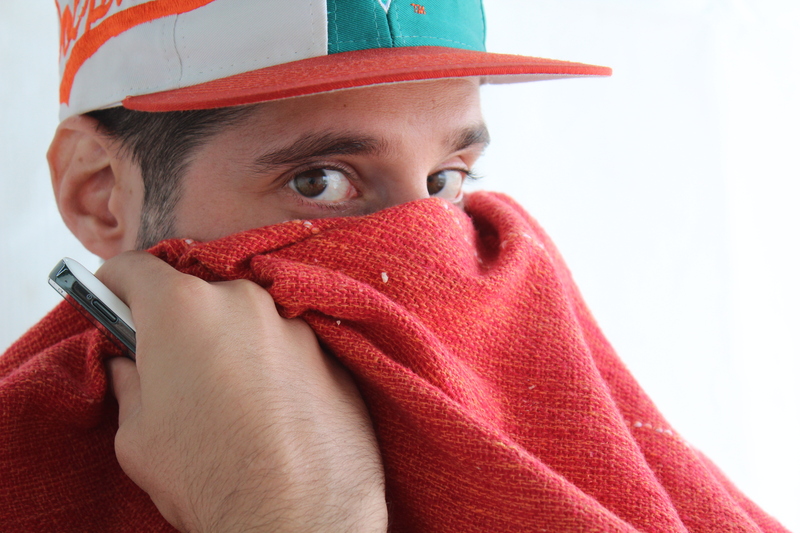 Kids run everywhere and nobody really has respect for keeping sand off your blanket, partly because it’s so jam packed in there that it’s impossible. I really had to put my own rigid no-sand-on-blanket OCD-ness on hold and try to relax. Admittedly, I was not always successful. But I tried. 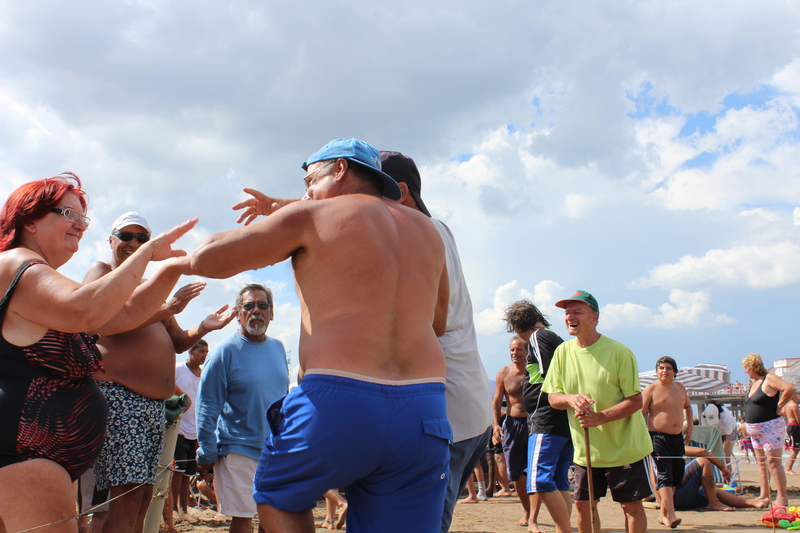 You look around and sense the joy and community and family that resonates in the air. It’s not the beach vacation spot I personally would imagine for a relaxing tropical vacation, maybe because I’m a bit spoiled with the Florida beaches, but you can tell memories are made here and people love it. Before making our way down to the beach we stopped to pick up some lunch before hand. Jesse got a choripan and next door I got this humungo milanesa sandwich. A milanesa is a thinly sliced cut of beef breaded and pan fried. A lot of people eat it with sauce as an entre or on a sandwich. As I was moving down the line in front of the counter, it reminded me of an Argentine Subway, except without all the veggies. The picture doesn’t do the size of the sandwich justice. Each half was at least 7-8″ long and 4″ wide. I couldn’t finish both myself. 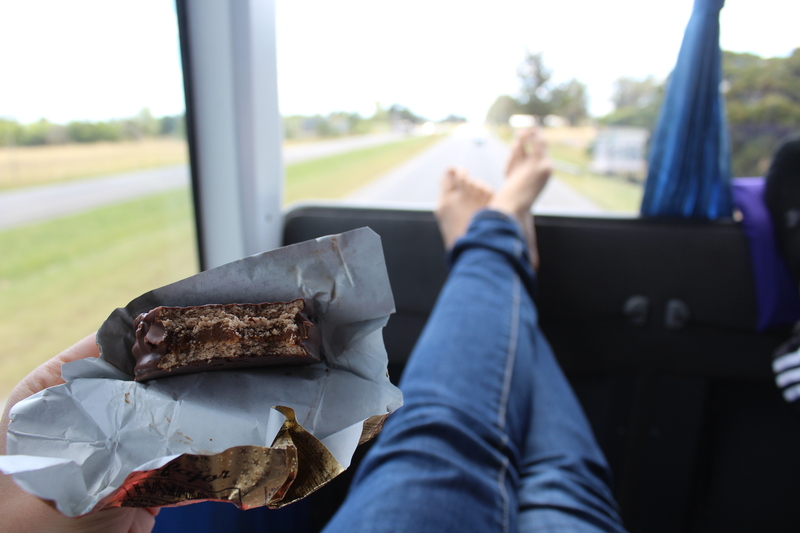 My favorite food of our trip. 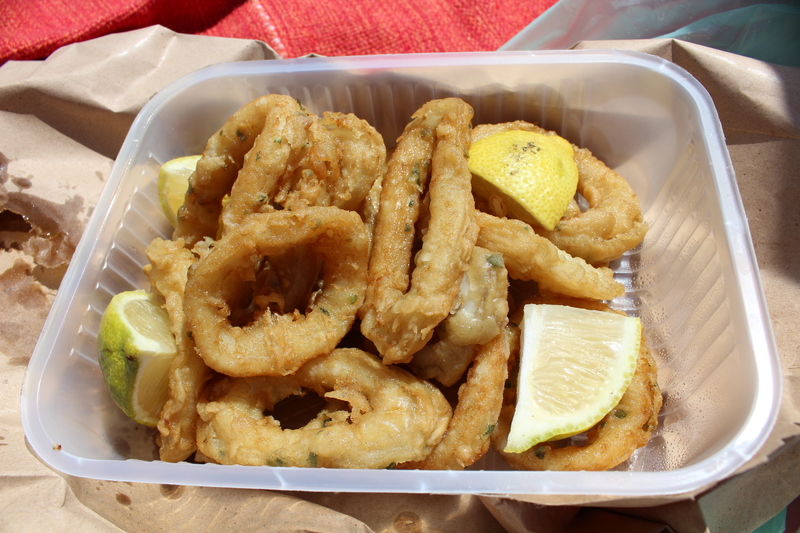 Rabas!! 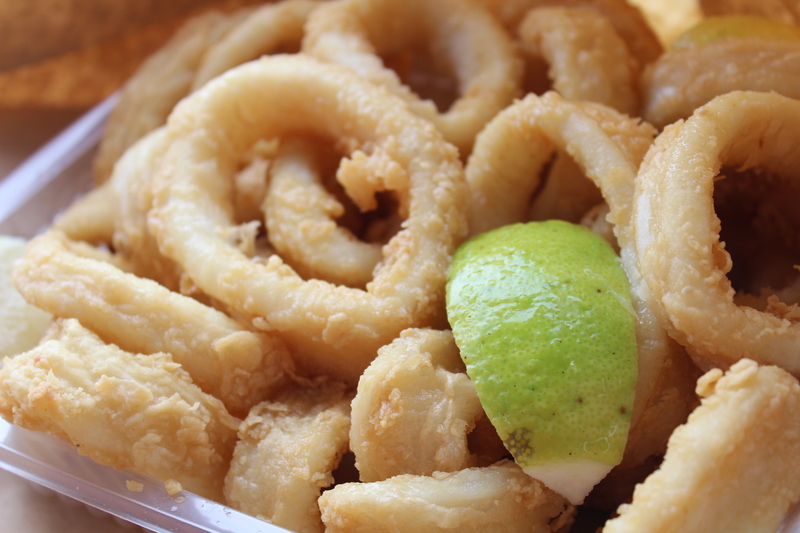 They are basically fried calamari, but much bigger and more tender than we get in the States. They also don’t have the tentacles (those are called calamaris). 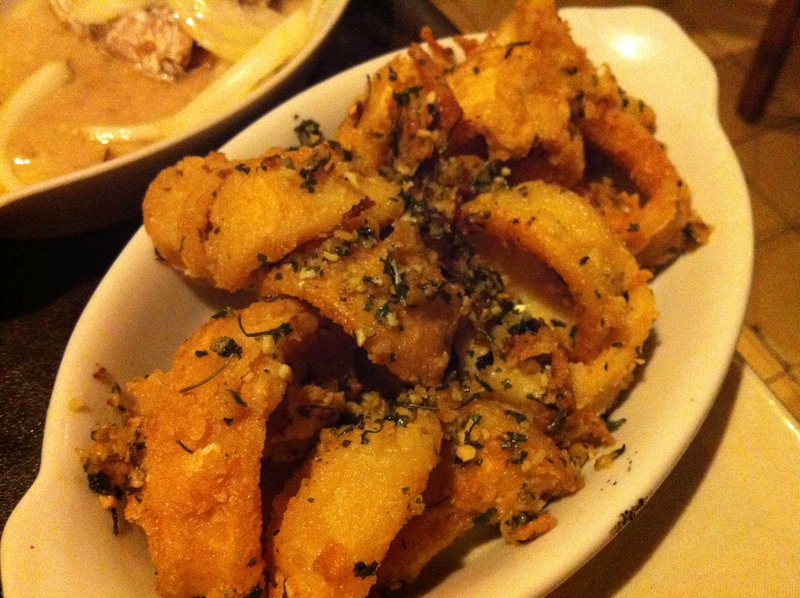 The breading usually has some minimal herbs in it and they are served with lemon wedges and that’s it. Or they have a provençal sauce on them of garlic, butter, herbs. A.Mazing. 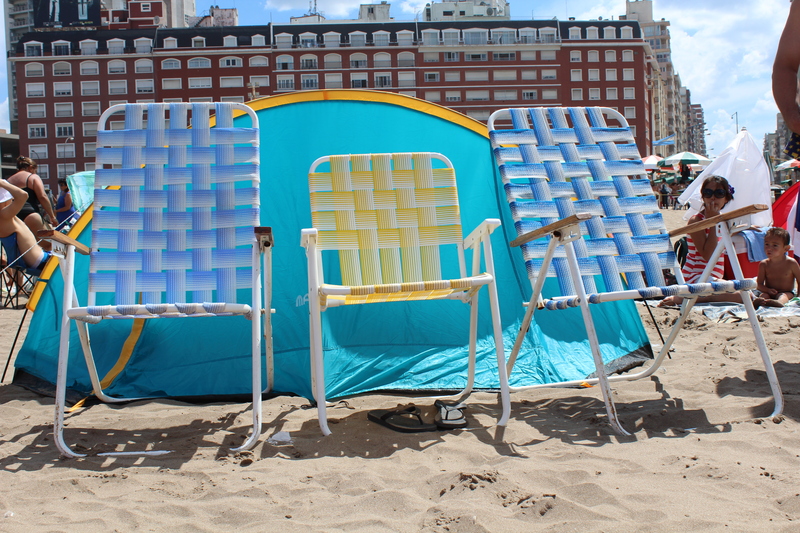 Sometimes all you need are some beach chairs and the sun. Sometimes you need more… People come here for the entire day. They set up camp. Most families have a huge umbrella (as you see here) or a little tent/awning thing. Just something to block the sun. They lay in chairs and not on the sand. 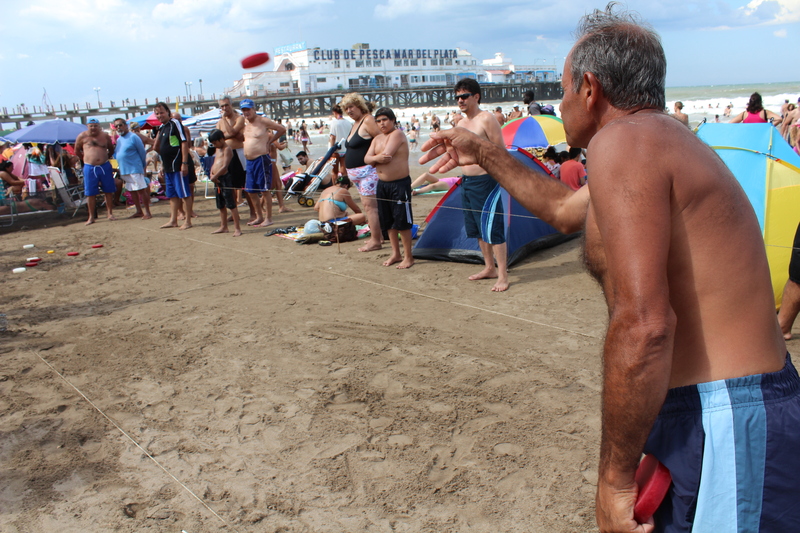 This may also be the reason why people aren’t so conscientious of knocking sand on people. 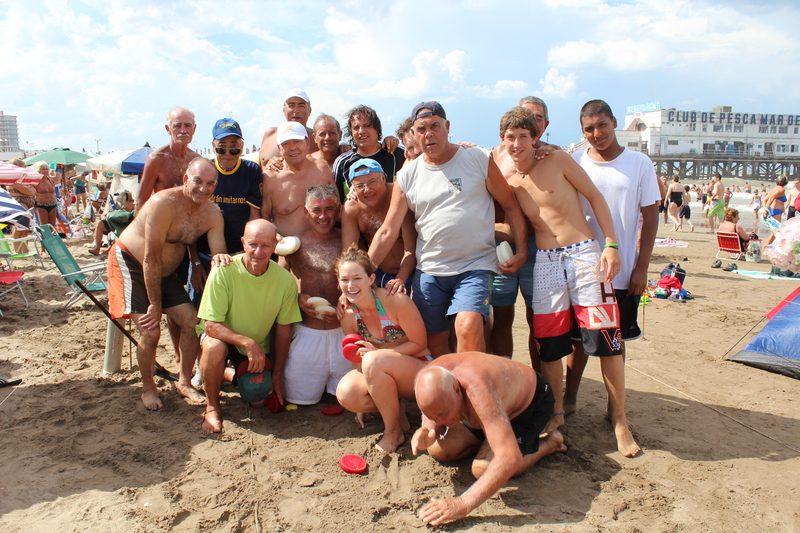 Groups have multiple coolers packed with sandwiches and flavored waters and almost always a thermos of hot water for afternoon mate. A vendor selling dresses to a group of women from several families. Every minute or so you hear a new vendor shouting out the name of their wares or food. Reminded me of being at a sports stadium in the States. ¡Hay dulces! ¡Hay agua! This guy just casually rolls his popcorn machine onto the beach, like this is a normal thing. And amazingly I think it is. 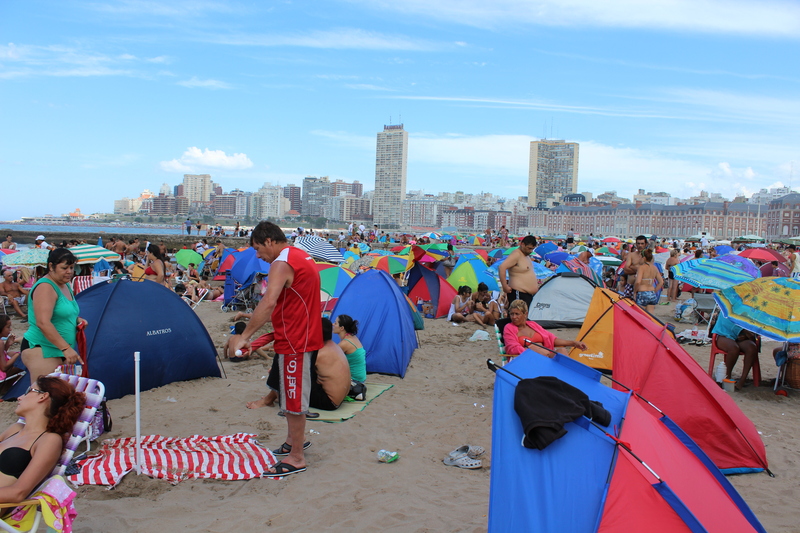 The beach just goes on and on filled up with the bright colors of umbrellas and tents. There is barely a path to walk through. But people are comfortable and happy. It seems like if you stay here long enough, you’ll make friends with your neighbors and may even plan to meet them at the same spot the next day. 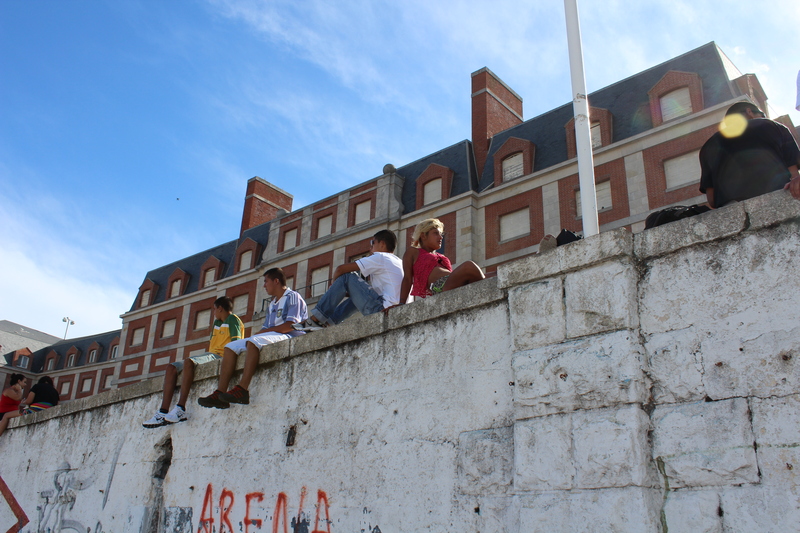 Children are usually allowed to roam freely. But this, of course, has it’s consequence that sometimes small children will become lost. Being the family-oriented, child-loving group that they are, there is a system to reconnect children and parents. When it becomes apparent that a child is lost, one adult takes charge of the child while the rest around them start to clap all together. I’m not positive, but it seems like all parents look around to see if it’s their kid whose lost and if so, they come to claim their child, as you can see below. People don’t stop clapping until parent and child are reunited. The community and trust between people is really incredible. 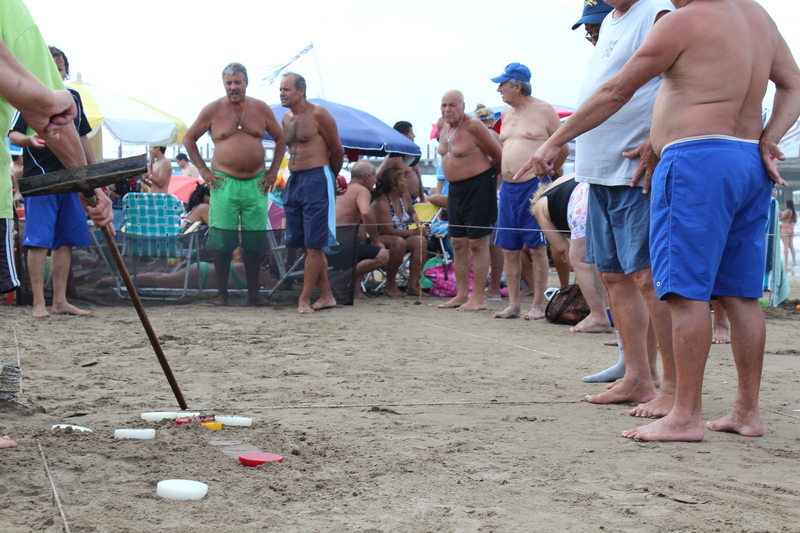 Tejo is a game played on the beach. 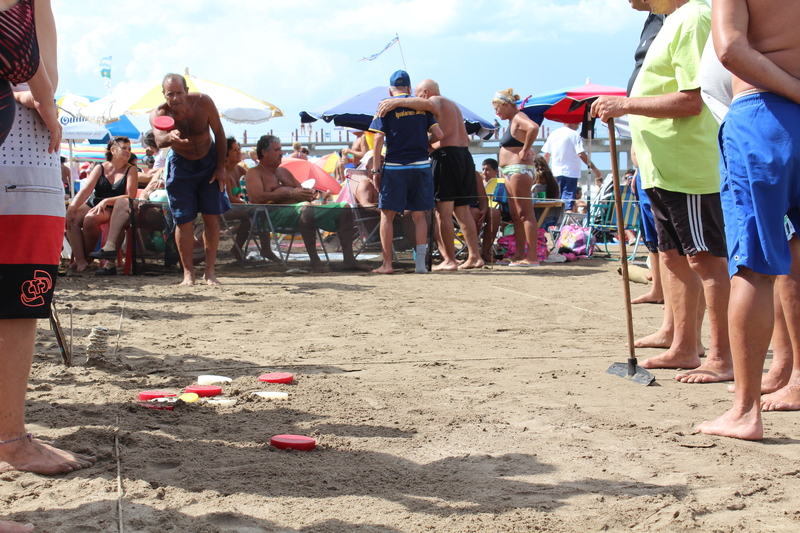 It’s like bocce ball or petanque but is played with plastic disques instead of balls. We may be in a different continent, in a completely different local, but this brings me right back to Brooklyn and the Bastille Day Petanque tournament. 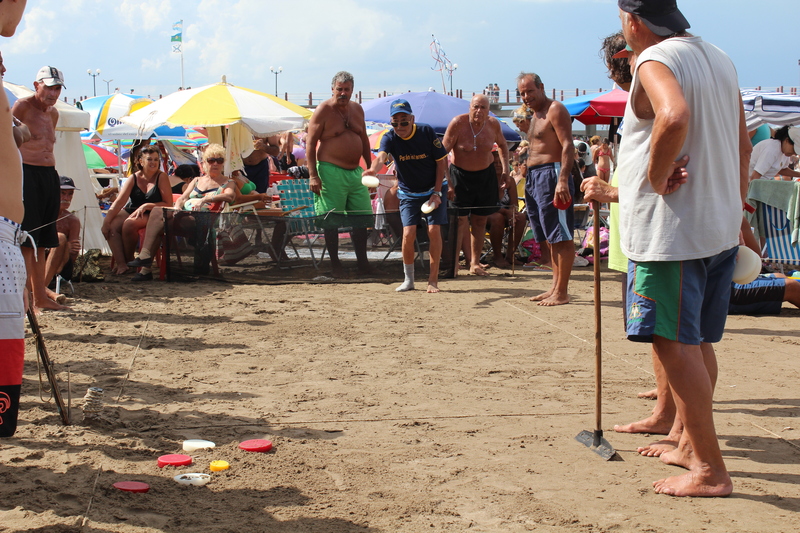 The playing area is marked off with thin rope and a crowd gathers around to watch the older men get their game on and strut their stuff. This guy above is the self-proclaimed best tejo player EVER. This picture is so familiar to me. Just like a couple pictures we took at the last Bastille Day we went to in Boerum Hill. Love this guy. So cool with his glasses half down the entire time. Final throw of the match. You can see the two guys in the back, who are on the opposing team, can’t watch. The guys celebrating their win with their biggest fan. This woman was their through the whole match cheering them on. Quite possibly my favorite picture of the whole trip. The two teams insisted on taking a picture with me. Then this guy in the front, who was not a part of the match, decided he wanted to jump in the picture. Apparently that was not cool and just as the pictures being taken, he gets kicked out. 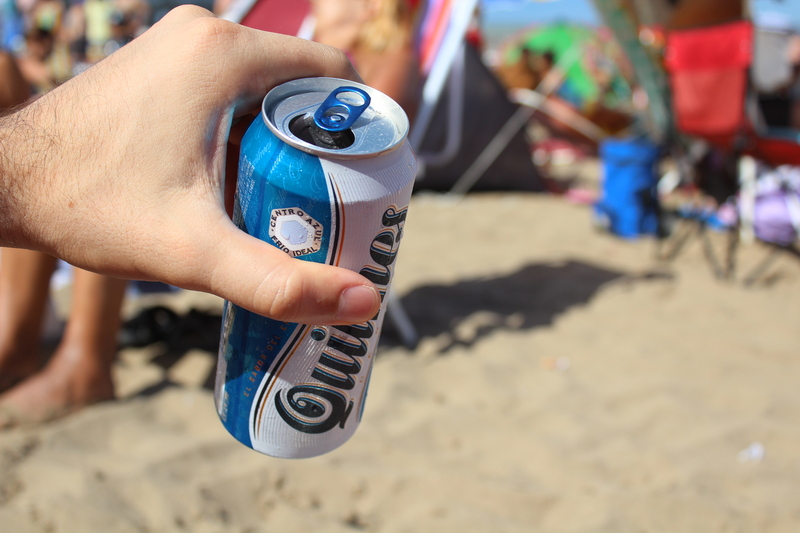 Over priced but oh so refreshing ice cold Quilmes beer. The Bud Light of Argentina. Perfect for the hot beach. 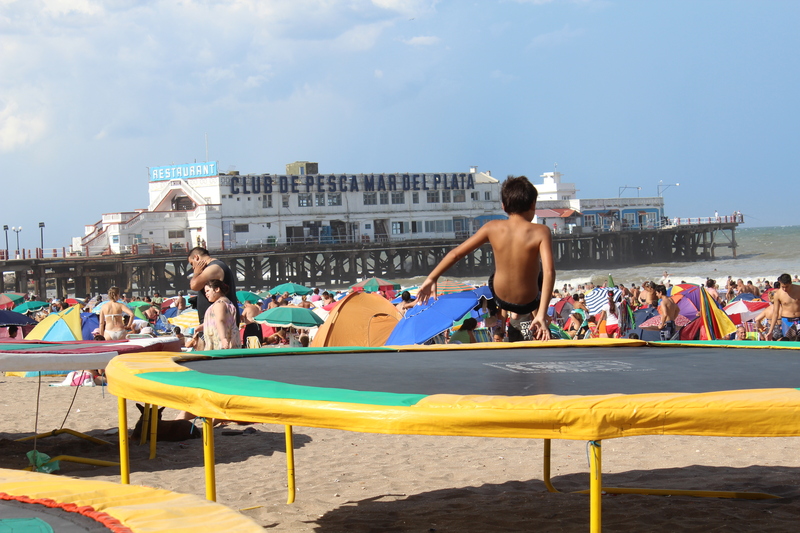 You can rent time on a trampoline – $8 pesos for like 10 minutes. I really wanted to jump but Jesse wouldn’t let me. Something about being accident prone and not having health insurance. Bleh. A fearless little girl doing gymnastics on the trampoline. This kid was sooo excited and proud to have his picture taken. 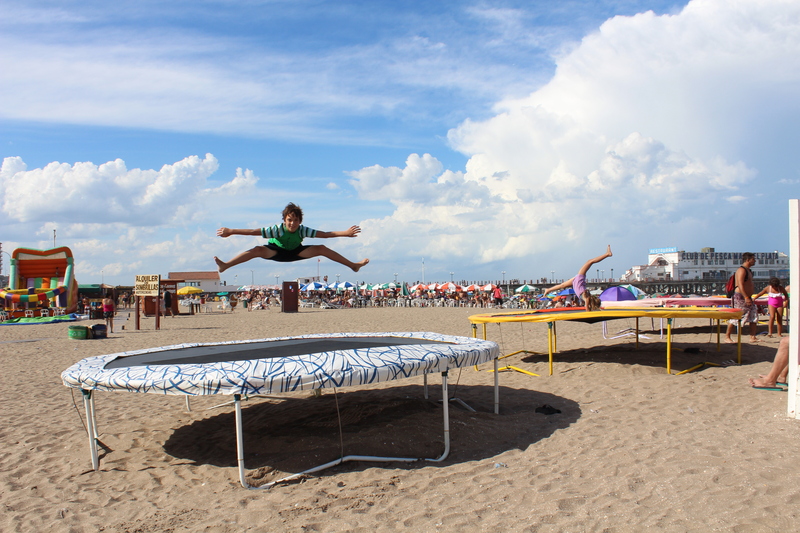 He kept doing jumps with a big goofy grin on his face. Some salsa while waiting for a Super Pancho (a hot dog with pix sticks topping). I started to take a picture of this guys pastries when he stopped me saying no photos! I apologized and then with a laugh he said I could only take a picture if he was in it. Who am I to say no to that? My favorite, besides his cool Argentine suaveness, is his employee behind him. 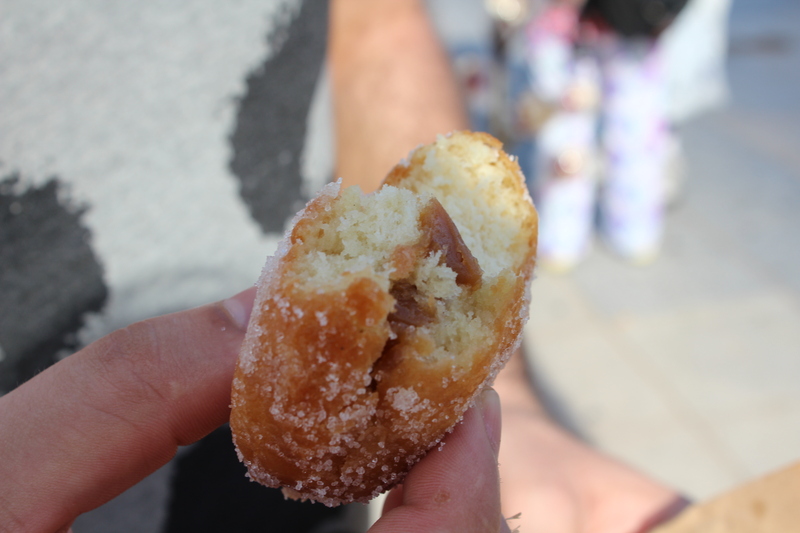 A sugar donut hole filled with, you guessed it! Dulce de Leche! 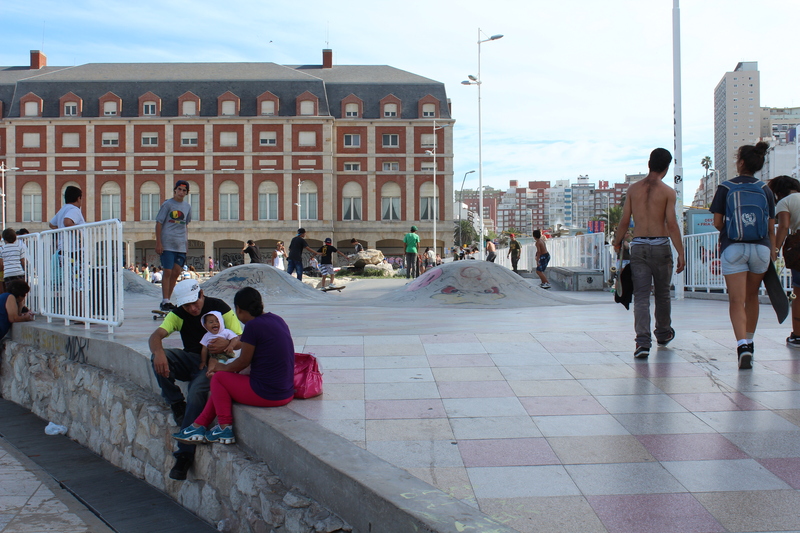 All around Argentina are skate parks for kids to ride their bikes and skate boards. So awesome. I would be terrified to do any of these moves, especially without a shirt. Call me an old lady, but I can now definitely appreciate all the pads that my mom used to make me wear while rollerblading. Kids chillin at the beach, being their cool selves. 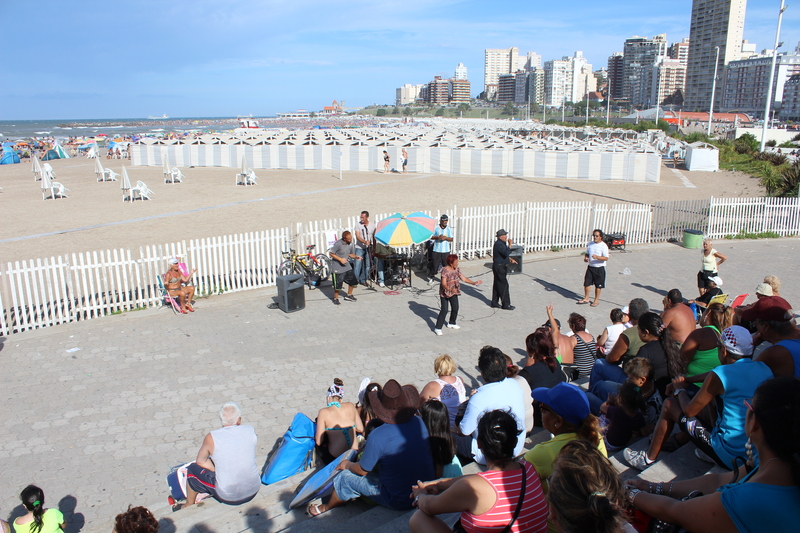 We were walking across the beach and saw this great tango music show. The guy is so Argentine it hurts. In between singing he would walk over to the umbrella where a friend handed him a mate. I don’t know if the woman in the front dancing is part of his show, but she was very enthusiastic. As were the older woman in the back sitting in the chair with a bikini, a tennis hat, and high heels and the guy playing the air-keyboard. Originally we were planning to go to another very popular seafood restaurant, but when we pulled up in the cab, the wait time was at least 45 minutes, which was not going to work out for our hungry bellies and the rainy skies. 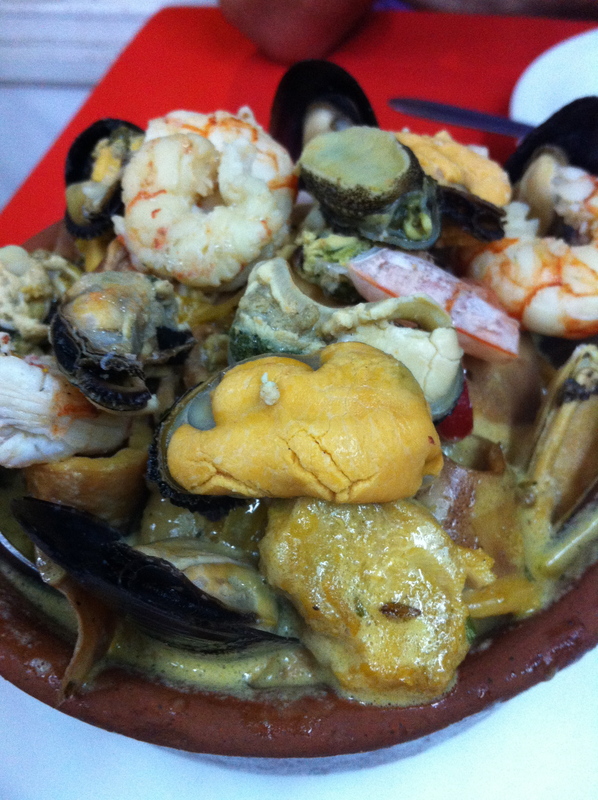 Our cab driver was a really sweet and incredibly friendly guy and recommended another more local restaurant around the corner called Paso Obligado, a spanish seafood/tapas restaurant. 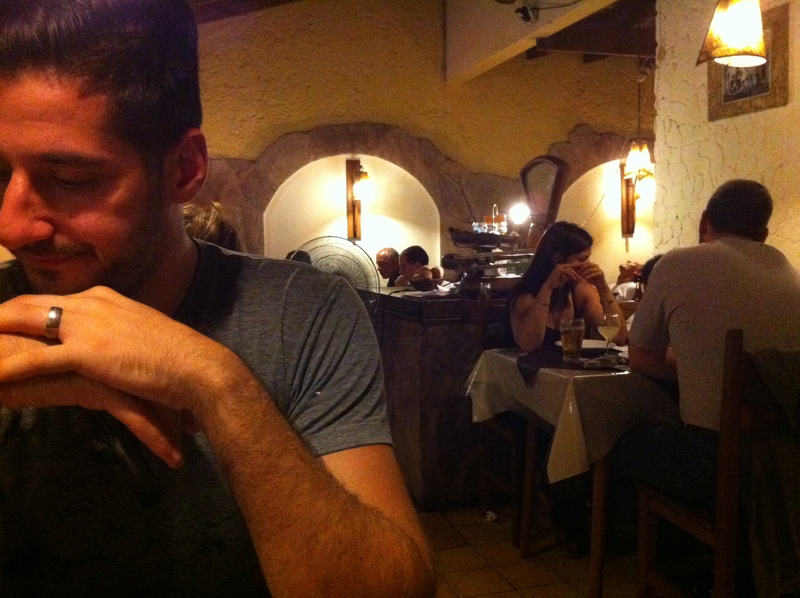 The decor was wonderful and felt very spanish. 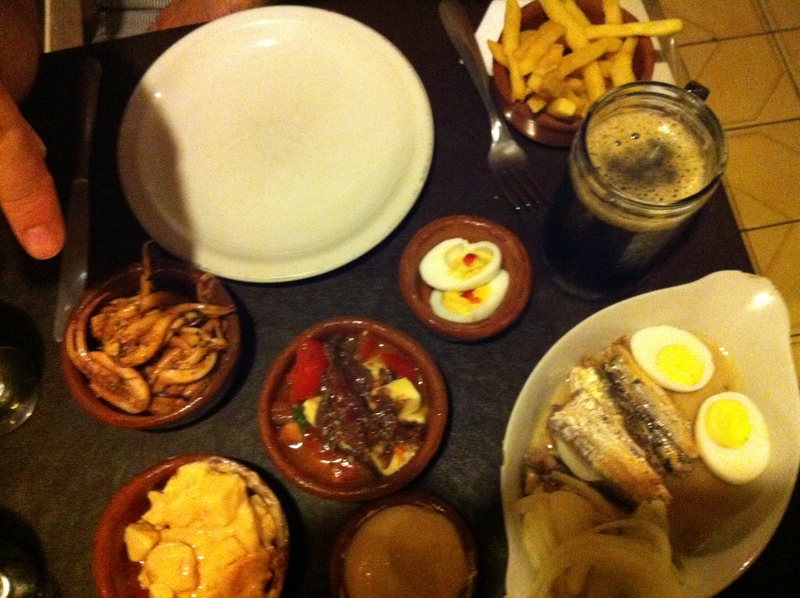 We had a tapas of seafood with two courses, one cold and one warm. 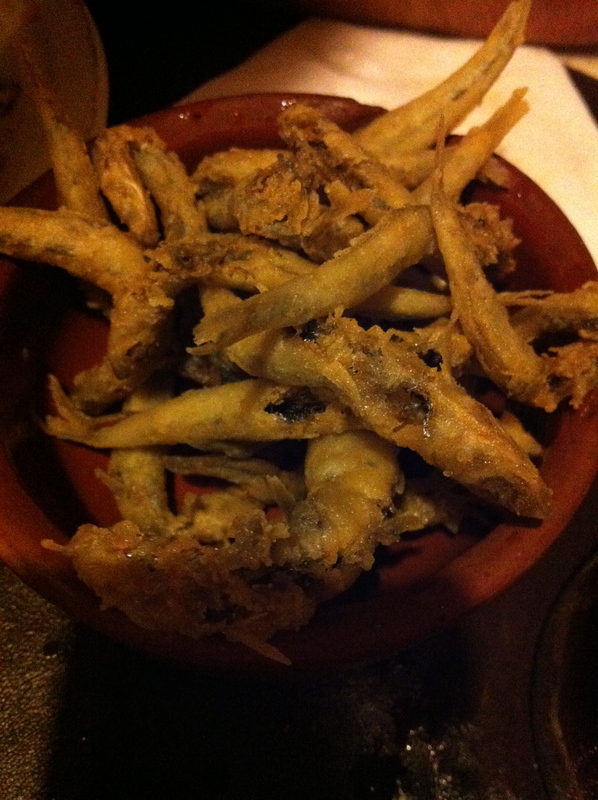 A lot of the warm dishes were fried, like these fried sardines. They were actually pretty good, though I couldn’t eat too many of them. After dinner, we walked around the corned, through a little bit of rain, to the Antares bar. Antares is an Argentine artesanal beer company that has some really delicious beers. The bar itself was really cool, a fashionable modern industrial design. 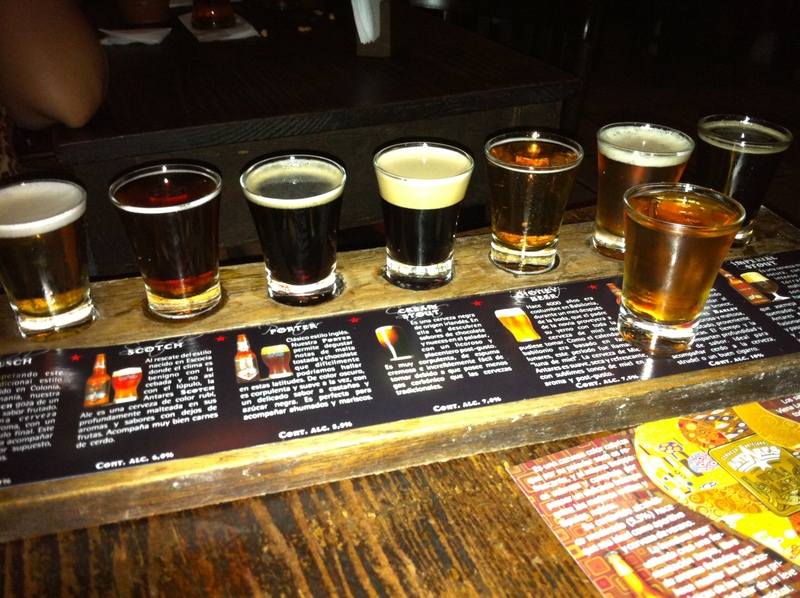 We shared a sampler and then ordered a couple beers. The second day we decided to forego the local beach for the private beach and see what that was like. 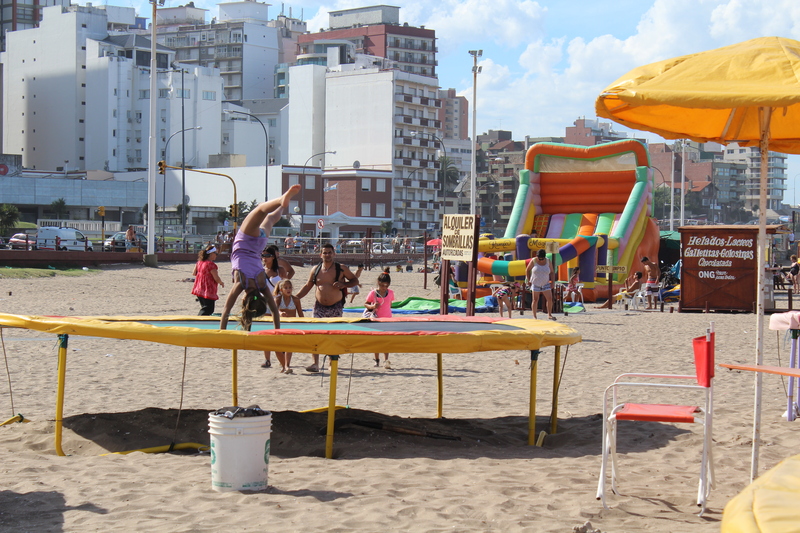 A lot of families will rent cabanas for the whole summer, a month, or just a week. 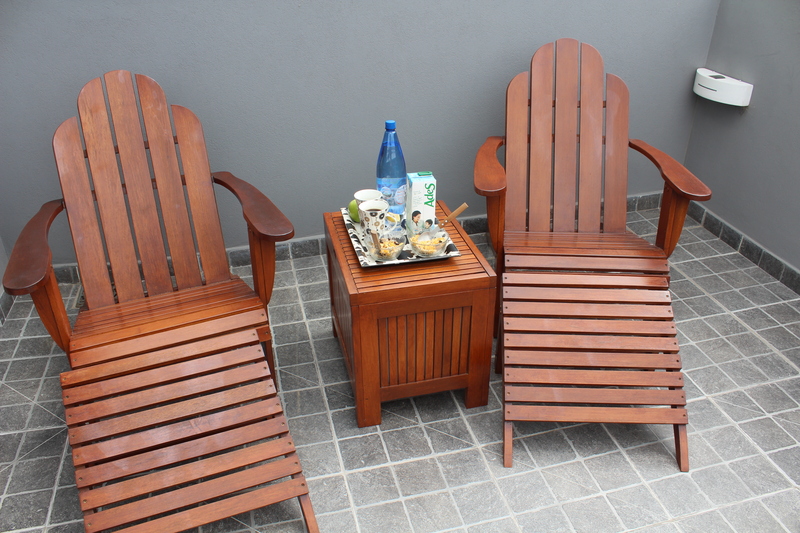 You can leave your beach stuff there throughout your rental time because the area is enclosed and secure. 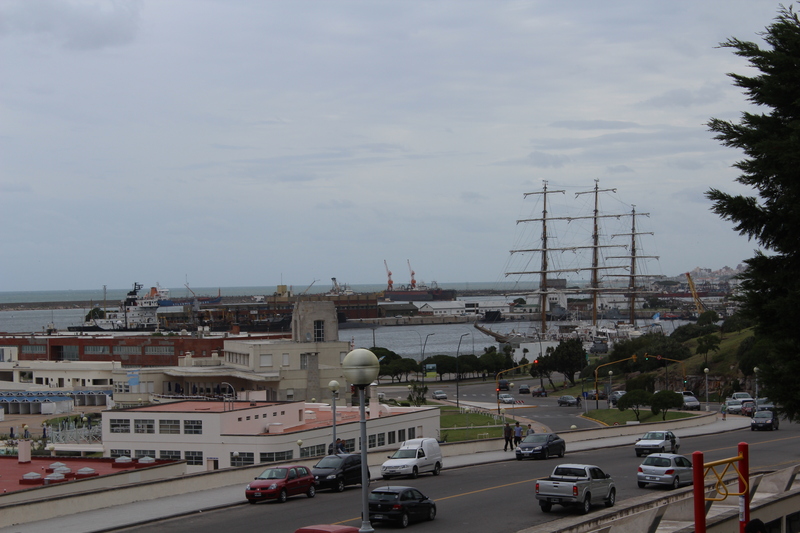 The day, unfortunately, was cloudy and a bit chilly. 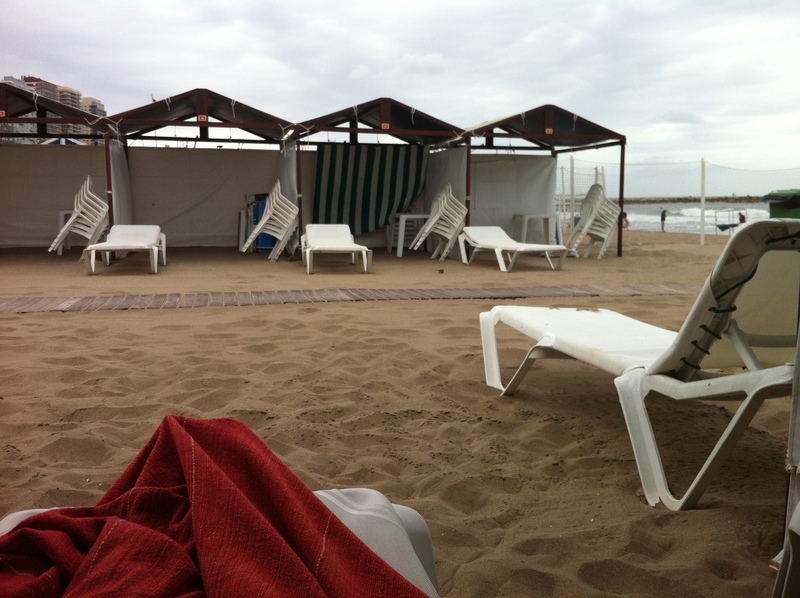 I guess it kind of worked out that we waited until the second day to rent a cabana because we had some nice seats and a little protection from any light rain coming down. Back entrance to one of the balnearios. 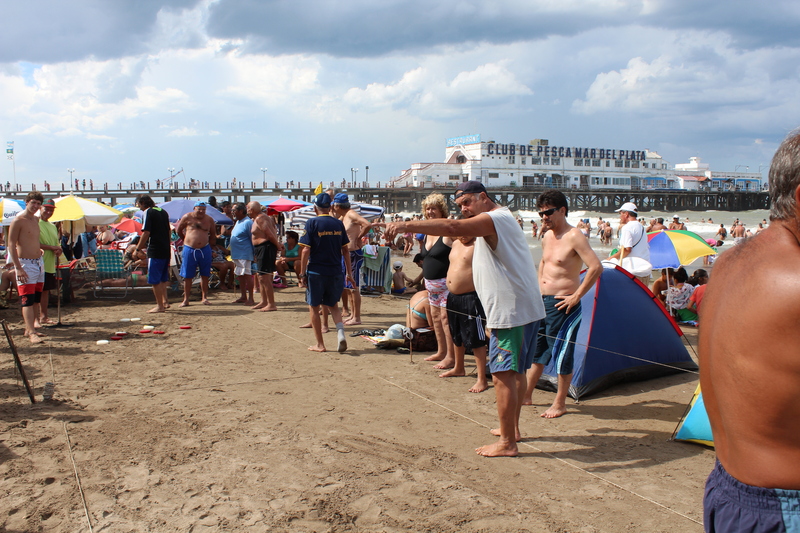 The balnearios fill the beach. Some have playgrounds and volleyball courts. 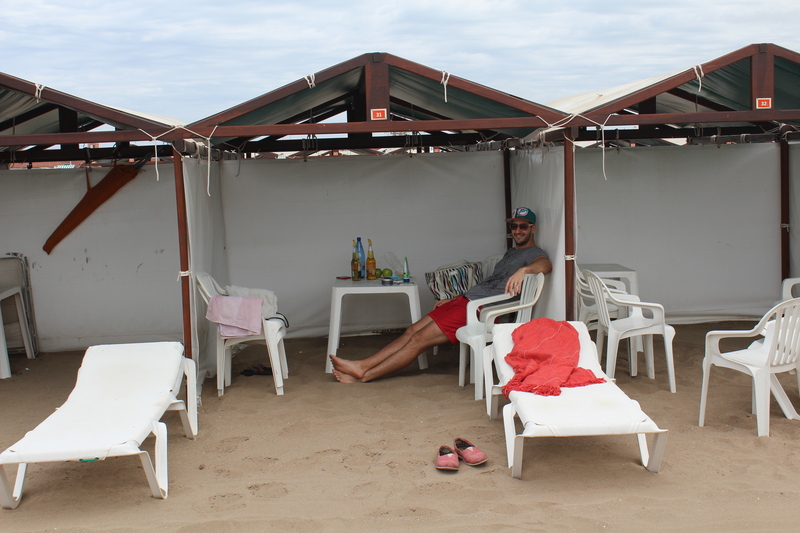 Our little cabana. Because it was Sunday and the weather wasn’t great, we had the whole area to ourselves. We brought some beer, a speaker, some books, and a cozy blanket and just chilled. A perfect day. Yes, more rabas. 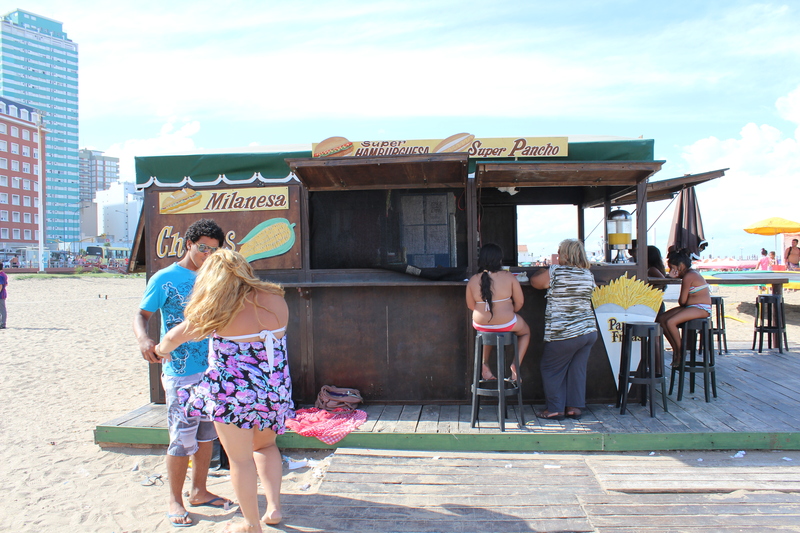 I may be obsessed… Most of these places have restaurants as well and you can order lunch on the beach delivered right to your cabana. It’s really the way to go. Relaxing under the cabana while it lightly rains. 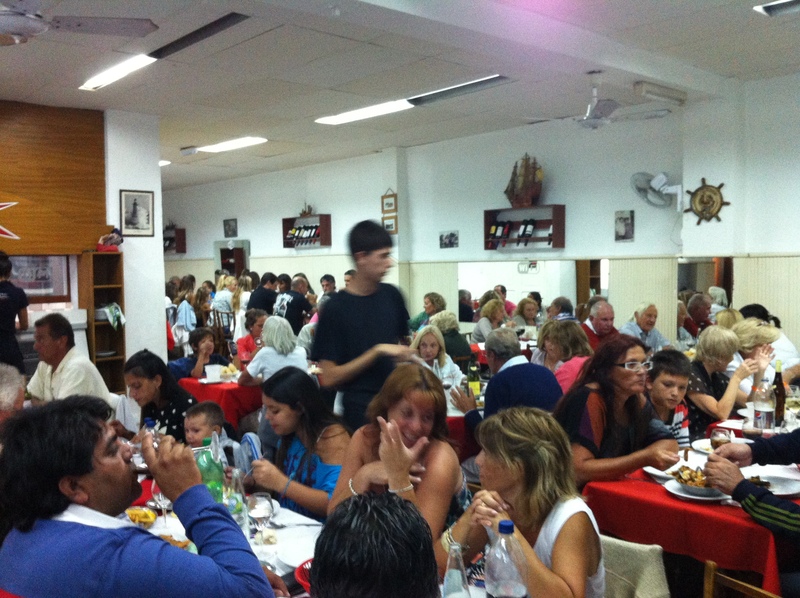 Dinner Sunday night was at Restaurant La Marina down by the port. We read a lot of great reviews and decided to check it out. Because we heard there was usually a crowd and the wait could be long, we got there a little early – around 8:45pm. 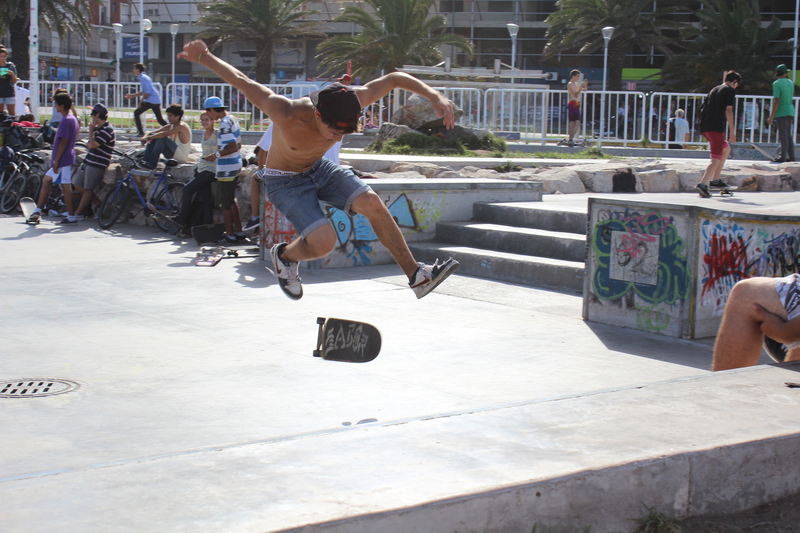 Argentina… I’m glad we did. When we arrived the place was empty. about 20 minutes after we sat down it was full with a line out the door. 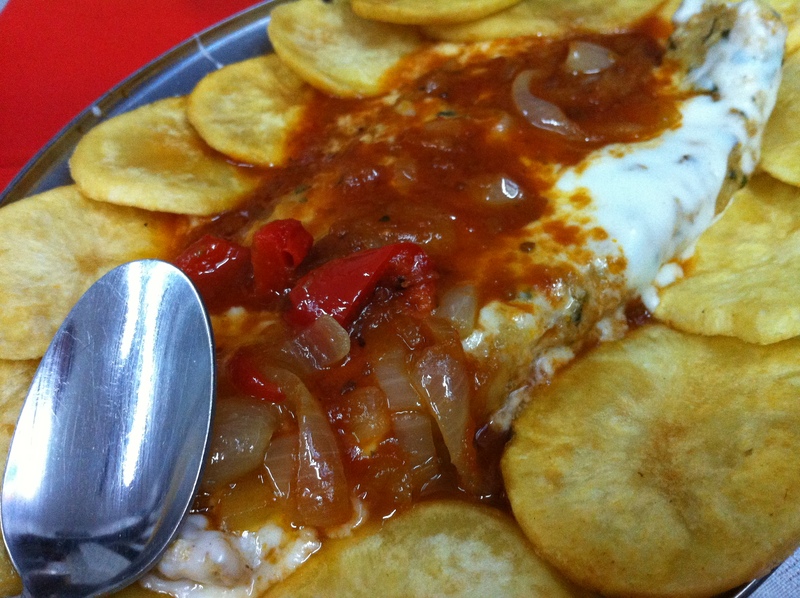 A white fish with creamy tomato sauce and baked potatoes around. The fish was super fresh and was cooked perfectly. Really flaky and moist. This cassoulet doesn’t look as good as it tasted. Everything was cooked to perfection and it had this delicious creamy saffron sauce with it. Just as relaxing as our ride there, but this time with a better view. 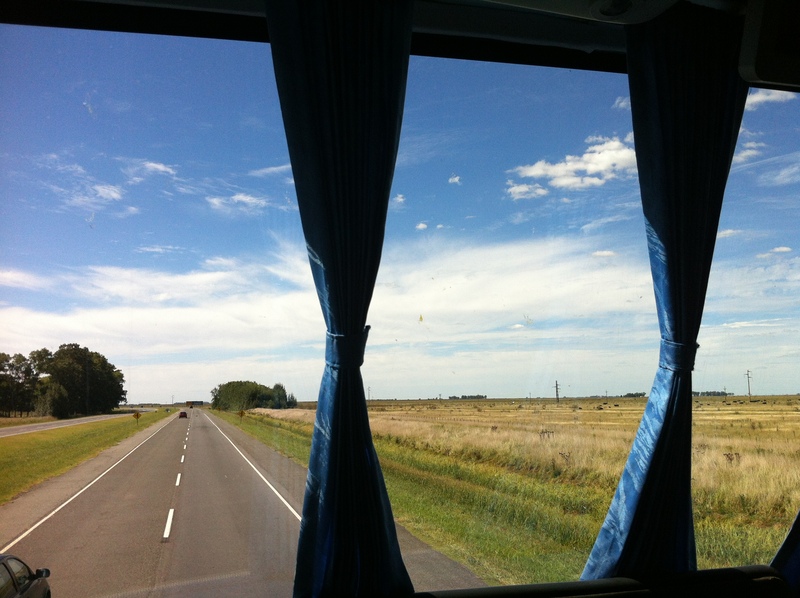 We road back in the early afternoon and had seats on the top row in the front of the bus. More alfajores. Dangerous. I have no will power. View from the top of the bus. Beautiful sunny day with clear skies and a wonderful ride back. 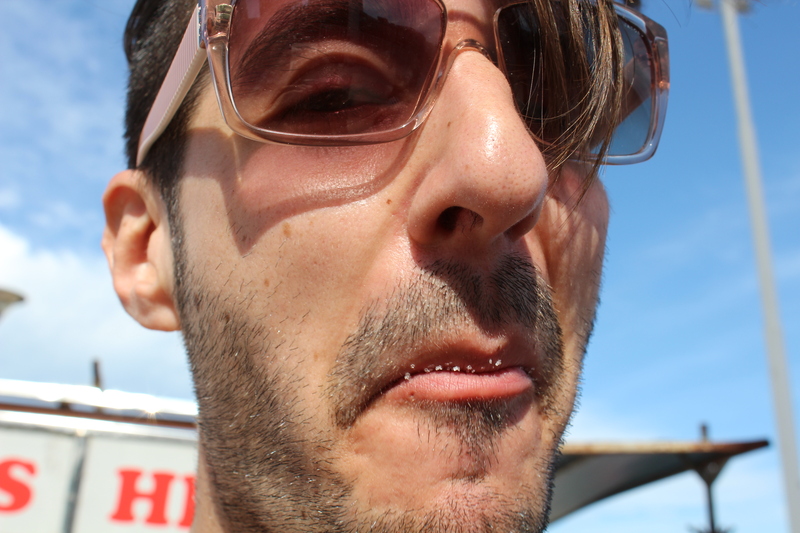 And now, if you’ve stuck it out through all these pictures, a little treat for you. A series of commercials starring Emilio Disi (an Argentine comedian) and David Hasselhoff. That’s right. David freakin Hasselhoff. Watch David Hasselhoff try to speak Spanish. Thank you for sharing your adventures! Looks like a great time and the food looks so enticing! Thanks! The food was great. Though I think I ate so many rabas that I had an allergic reaction. It was worth it!